Sam Gagner needed a car, and fast. The Toronto Marlies had just lost their third-straight on the road by a score of 3-1 to the Providence Bruins, and they were bound for a rebound the next night in Springfield against the Thunderbirds. Gagner, on loan with the Marlies from the Vancouver Canucks for the proximity to his family, however, would be heading the other direction. The forward was told the morning of February 16 that he'd been traded to the Edmonton Oilers. The former sixth-overall pick by the Oilers in 2007 was heading back to the familiar of Edmonton, where he made his name as the youngest NHL player 12 seasons ago at 18 years and 55 days at the onset of his first professional season. His new (and former) club and teammates were waiting for him three-and-a-half hours down the I-95, preparing for a meeting with the New York Islanders in Brooklyn that night. There was a lot to unpack about the trade, but even more to pack before hitting the road. 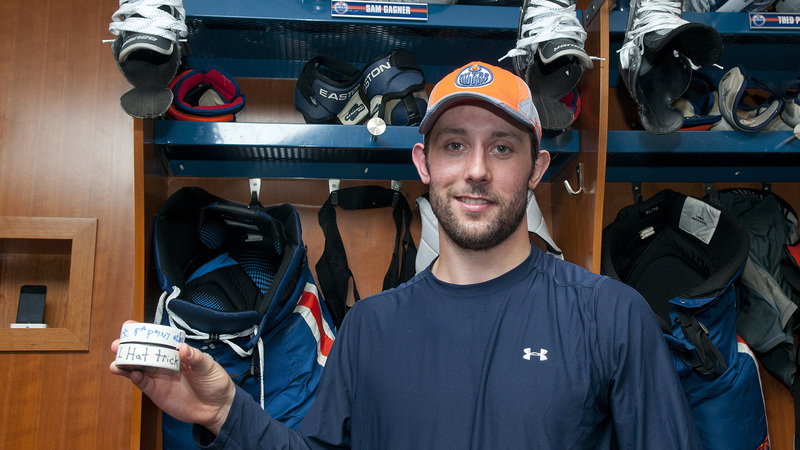 "I got a car around one o'clock, so I had to pack up, get something to eat, and get ready to come here," Gagner said. "I pulled in around four-thirty, so I had some time to get my gear all situated and get ready." After arriving at the Barclays Center prior to puck drop, the new threads he found hanging in his newly-minted Oilers stall were anything but new. "With it happening so quickly, there's definitely a lot of emotions that come with it," Gagner said. "I think when I first walked in here and saw my jersey with the familiar number 89, it was a really great feeling." Gagner played 481 games for the Oilers from 2007-15, playing a further four seasons scattered across Arizona, Philadelphia, Columbus, and Vancouver before finding himself in the AHL earlier this season with the Marlies. "I've bounced around during my career a little bit, but I've always felt at home in an Oilers uniform," he said. Despite growing up in Oakville, Ontario, returning to Edmonton was a homecoming. It's where he met his future wife Rachel and the now-mother of their two boys Cooper and Beckham, and it's where he took on the personal responsibility of helping advance the Oilers as a fresh 18-year-old taking his first strides into the NHL. It's where the city marvelled in his shootout ability, and where they chanted his name long into the following week after recording eight points against the Chicago Blackhawks over seven years ago. With so much history for Sam, Edmonton was a hard place to put in his past. "Playing in Edmonton as a young player, it's a tough place to move on from emotionally because of the passion the city has for hockey," Gagner said. "You become emotionally invested, and for myself coming in as an 18-year-old going through a lot of ups and downs early in my career, you put a lot into trying to help move the team forward and become a winning team." There certainly was a lot to unpack on that three-and-a-half-hour drive from the unfamiliar back to the familiar. "I think you hear about everything the city has to offer in terms of being a hockey player, and that's all I've ever wanted to be." In the argument of nature versus nurture, Sam Gagner had both working to his advantage. The Toronto Marlboros' Minor Midget AAA group of 2005 was a special one. Coached by James Naylor and Sam's father Dave, who played 15 seasons in the NHL with seven different clubs, the Marlboros were one of the most dynamic minor teams in Canada with a roster that included John Tavares, Brendan Smith, and Sam himself. The Marlboros are a breeding ground for young hockey talent, and continue to be to this day by pumping out future and present NHL talent like Quinn Hughes, Ryan McLeod, Connor McDavid, and the Strome brothers. After their practices ended, it regularly extended to the Gagner's backyard rink where they'd continue to play long into the night before doing it all over again. Through Sam's coaches, skill development and fostering a love for the game were always at the forefront. "We had a pretty special group, and I think coaching was a huge part of that," he said. "My dad and James always preached skill and trying to develop our skill. I think at that age, that's the most important thing." Winning the OHL Cup and the Greater Toronto Hockey League, one of the world's biggest and most competitive minor hockey leagues, was an added bonus. "You talk about kids at that age and it's all about winning. For us, it was all about enjoying ourselves and trying to develop skill. We ended up winning because of it. It was a lot of fun growing up, and I learned so much because of him." Three Marlboros were selected in the first 10 picks of the 2005 OHL Entry Draft that year, but a previously-expressed interest by Sam to go the college route with the University of Wisconsin-Madison meant he'd have to wait until the fourth round for the London Knights to go off the board and select him on a flyer. Going back to play junior in London, where Sam was born, would be a Gagner family affair. His parents and sister joined him in the move to allow him the opportunity to play for the Knights while having the benefit of living at home at the same time. "That was good for me," he said. "Getting the chance to live at home and play junior isn't something a lot of guys get. You're always living with a billet family when living away from home and that kind of stuff, so that was good for me." 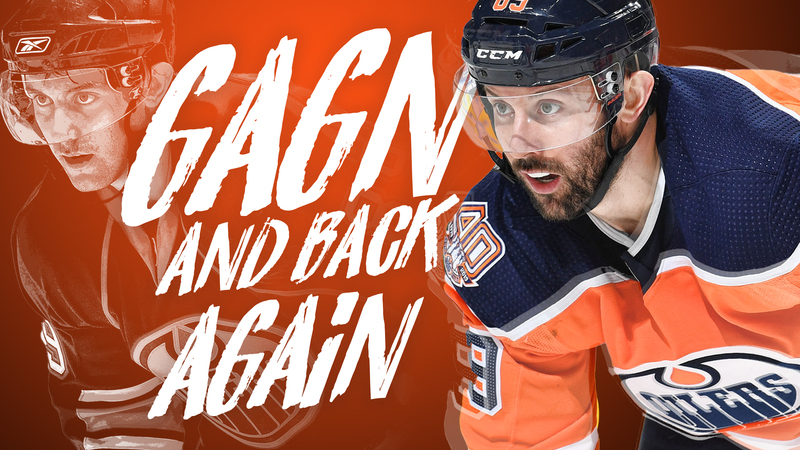 Gagner recorded 118 points (35G, 83A) in his only season with London alongside future NHL stars Sergei Kostitsyn and Patrick Kane. "Getting a chance to play with those great players, we weren't able to win the championship or anything, but we had a great season and had a lot of fun together. I felt like I grew a lot that year and it was really good for my development moving forward." Just as his dad helped him on the ice with the Marlboros, his 15 years of NHL experience and presence on the Knights' bench as an assistant coach helped him prepare for a transition to the NHL as an 18-year-old. "That's the one thing I think you realize as you play in the NHL - each year you learn more as you get the experience. I never really had to go through that because my dad had that experience for me and gave me a leg up in that regard," he said. "I felt pretty polished coming to the NHL as an 18-year-old, I guess more than you would consider for most. I felt ready, and if I had any questions when I did go through some adversity, I kind of always had my dad to lean on." It was the moment before the moment happened. The Washington Capitals were on the clock at pick number five in the first round of the 2007 NHL Draft in Columbus. Gagner, flanked by family and friends, awaited with tension for his name to be called. He had watched Kane, his Knights teammate, go first overall to the Chicago Blackhawks a few picks prior and knew more than likely he'd be the next name from London called. "It was a lot," he recalled of playing the waiting game in the stands. "I think there's a lot of nerves that go into it. You work your entire life to get that opportunity to get drafted, and wherever you get picked is where you're spending the next few years of your life. It's a huge life change. Capitals General Manager George McPhee stepped to the mic, and as soon as 'London' reached Sam's ears, he began to stand. "The pick before me, I don't know if there was a mix-up, but it was Washington and when they went up there and said 'From the London Knights…', I thought I was going to Washington," he said. "But there must've been a mix up and they said 'From the Calgary Hitmen…' and they took Karl Alzner. "I had a group of friends there who were sitting in front of me. They stood up too, but then you settle back in." Luckily, Sam wouldn't have to sit on his hands for long before the Oilers came to the podium at pick number six. "I didn't have to wait too long going with the next pick. It was definitely an exciting day and something you never forget. You're obviously really excited to see where you're going to go, and when I did find out it was Edmonton I was obviously thrilled." If that pick didn't happen, if that confusion hadn't occurred, Sam's life could be a lot different today. A night out with mutual friends during his rookie season led to Sam and his future wife Rachel being introduced to one another. The two wouldn't date for another two years as Rachel considered medical school and Sam continued to take early strides into the NHL. "I think all those things happen for a reason, and I think everything lined up in that regard," Sam said of his drafting by the Oilers changing his life. "I think about that a lot. I met my wife here and now we have two boys and I couldn't be happier in terms of my family life with everything Edmonton's brought me in that regard." Gagner's affection to the on-ice dramatic quickly became part of his identity as an Oiler. After stepping up for his first opportunity in the shootout on October 25, 2007 against the Minnesota Wild, 'The Gagner' soon became his trademark. With Minnesota shooting first and converting their initial opportunity, it was a less-than-normal sight seeing a rookie Gagner skate to the circle for his first-career opportunity. Gagner shoulder-faked Josh Harding, who dropped to one knee and read the forward's next move by sticking out the right pad when the puck moved to his backhand. With Harding motionless at the top of the crease, Gagner made it look all too easy pulling the puck back across his body and tucking it away with speed. "The initial move I always used to do when I was younger, I started doing in junior," he said. "I had a lot of success in junior with it then I brought it to the NHL and had some success there." The move would evolve into a combination of many smaller movements, with each next shootout attempt often being a slight variation of the one before. The backhand toe drag wasn't something that was easy to pull off, especially in pressure shootout situations, but Gagner was keen to make it work and turn it into a staple of his one-and-one repertoire. "I can't remember where I saw someone do the backhand toe drag, but I started trying it and noticed when I went to my backhand, the goalie was always a little late but he'd get there and stop me," he said. "If I stopped in the middle, then went back to my forehand, I think I'd catch him. So I started trying it in practice and it was working." It's an all or nothing gamble to render the goalie helpless. "It's one of those things that if you do in a game or in a shootout that's kind of all or nothing because if you miss the puck, it's going to end up in the corner," he continued. "You have to be pretty confident with it, so I practiced it a lot. When I got comfortable with it I was able to try it a few times and it's worked for me. I obviously can't do it every time, you have to try and keep things fresh and keep the goalies guessing." If you ask Oiler fans what they remember about Sam Gagner outside of the shootout, it's more often than not the night of February 2, 2012. The Oilers trailed the Chicago Blackhawks heading into the first intermission, with an uphill battle to come in the ensuing periods. A line shuffle was needed to help the players find chemistry and a new approach to the contest. "I think looking back on it, I wasn't happy with my first period," Gagner said. "I didn't play very well and then our whole team was kind of in a funk, so we switched lines and I got moved up with [Taylor Hall and Jordan Eberle]." Little did Sam know, it was the shuffle that sparked history. "It was just one of those nights where everything started to go my way." After Patrick Sharp scored 40 seconds into the frame to make it 2-0 Chicago, Gagner scored once and assisted twice with his newly-assembled linemates to level the score through 40 minutes. "We kind of clicked right away in the second and then in the third period it felt like every time we had a 5-on-5 shift, we scored," he said. "It was one of those things where I wasn't in a rush to do anything and the puck was just following me around. I felt very patient in letting the game come to me." A rebound fell to Gagner to bury at the back post 1:54 into the third period for his second of the game. He notched the second assist on the Oilers fifth goal, then scored back to back for his hat trick and fourth tally of the night to put the game out of reach. But history, and the Oilers record of eight points in a single game set more than two decades earlier by Wayne Gretzky and Paul Coffey, was not. "I probably could've played the whole third period if it came down to it," he said. "But it was one of those where you don't want to take ice time away from other guys. I felt good, and they kept putting me out there. Those games you have unlimited energy. When you're able to score early, especially as an offensive player, it gives you a little momentum." With under four minutes remaining, Hall received the puck and dropped it to Eberle, who passed it to Gagner inside the left circle. Eberle was left wide open at the back door, and Gagner wasn't going to make a mistake setting his linemate up for the tap in and his fourth assist and eighth point. Every one of his teammates on the ice knew the significance and swarmed Gagner. Fans at Rexall Place that night couldn't contain their applause, celebrating until the final horn and long into the following days. "It was one of those games that will probably never happen for me again in terms of the feeling I had. Then in the third when fans are chanting my name, I don't think there's a way to recreate that feeling." It's never a bad idea having a doctor or two on speed dial when you're a professional hockey player. A broken jaw sustained back in September of 2013 led to six screws and a plate being used to put it all back together, plenty of teeth being replaced, and the wiring of his jaw shut for three days. "Whenever I have stuff that keeps me out of the game, it's nice to have a doctor on call, basically," he said of Rachel, who became a Doctor after graduating from the University of Alberta in 2013. "When I broke my jaw she was super supportive of that, and her dad is a prosthodontist, so he deals with oral surgery and all that stuff also. He was really helpful throughout all that as well, so being in a family of doctors has had its benefits for sure." If the injury taught Sam anything, it's that when it rains, it pours. The next summer, Sam and Rachel's schedule was packed tight preparing for their July 2014 wedding in Muskoka, Ontario when he got a phone call from his agent two weeks prior to their tying of the knot. For the first time in his hockey career, Sam had been traded and he was heading to the Tampa Bay Lightning. Almost an hour later, he'd be dealt again to the Arizona Coyotes. He broke the news to his wife Rachel at their family cottage that their next few weeks were about to get a little more hectic. 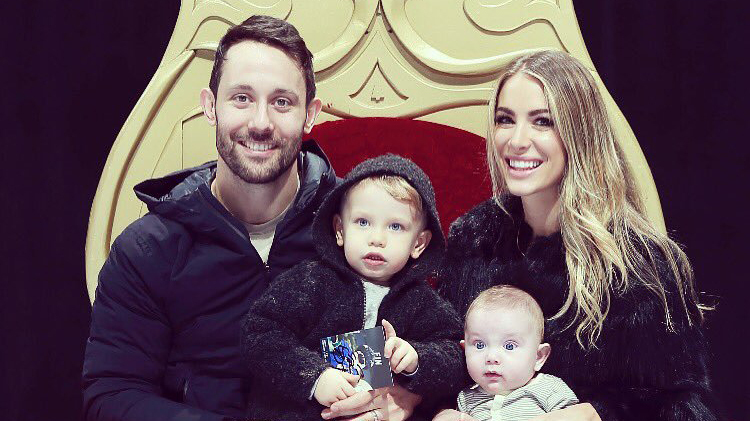 "I was preparing for my wedding, it was another week or two from there, and sometimes that's just the way it goes," Gagner said. Seven seasons with the Oilers had went past, and progress had been hindered. It wasn't a far away thought in Sam's mind that this eventuality would come sooner or later. "I knew it was a possibility. We hadn't really turned a corner as a team, I had some injury problems that year, and it was kind of something that I expected," he said. "But at the same time it's always a shock if you haven't been traded before." Then began a long cycle of juggling personal and work lives for the next four years as Rachel continued her practice as a doctor, Sam played for four different teams in as many years, and the couple began a family. Sacrifices were made on both sides, but they were always able to find a routine that worked. "I feel for her. She went through all that schooling, I get traded to the States, she gets pregnant, I get traded again, and then she gets pregnant again," Sam said. "I feel bad that I've kind of put a stall on her career, but she's been unbelievable throughout the entire thing. She never complained when we had to move city to city, or the amount she's had to do taking care of the kids and putting her career on hold." The trade proved to be an experience, that in the long run, brought them closer together. "At times, it's tough on the family life moving around being in the minors a bit this year and not being with my family for a little while, but it all just makes you stronger and I'm happy it's led me back here. I'm really comfortable, and really enjoying my time in Edmonton." A hectic stretch for Sam didn't stop after that drive to Brooklyn. That morning he was a member of the Marlies competing in Providence. Then, within 48 hours, he'd made his second debut against the Islanders before he was back in the Edmonton community donning the Orange and Blue for the team's annual autograph session at West Edmonton Mall. Not only was the signing session an opportunity for Sam to rejoin the community that gave him so much, but also a chance for career-long Gagner fans to bring old crested and numbered jerseys out of the woodwork to once again enter their regular rotation of Oilers apparel. "That's probably the biggest reason you love playing in Edmonton is that passion for the games and the support they have for their players," he said, citing Oil Country. There were also the logistics of getting his family back and settled in Edmonton, where much of Rachel's family remained. Having help on the family side with this trade would take a big weight off their shoulders after she was forced to step back from her career to take care of their boys while Sam was on the road. "That's the one part about hockey - you don't have a lot of help when it comes to kids when you're away from your family," he said. "Everything about being back in Edmonton has been great for us and we're really enjoying it. "I think being back here is going to be great for us in terms of getting her a chance to get back to work. Having her family around, especially when you have kids, is always super helpful." A royal return has given the couple a chance to take in the evolution of Edmonton's downtown since Sam last played in an Oiler uniform. Having more family around means plenty more opportunities to pawn the kids off for a night or two. "Edmonton's always had a great restaurant scene, and the one thing I've noticed is there's just more and more going up around the city," Sam said. "There's a lot of great places to eat, and I think with everything that's going on downtown there's even more to do than before. Since we've been back, obviously with kids it's a little harder to get out than before when we were younger, but my wife and I have been able to go out for dinners." If Gagner's learned anything over the past five years, it's to expect the unexpected. One morning, he was a Marlboro. By the evening, he was back playing his 482nd game for the Oilers franchise after spending five seasons separated from his last appearance in their silks. He'd record his 500th game on March 26 against the Los Angeles Kings, and finish the 2018-19 season with five goals and five assists in 25 games played. "I think the number is pretty special," Gagner said of the 500-game milestone. "Just to play one game is an accomplishment, then the more you get it's a pretty special feeling. There's been a lot of great players that have come through this organization. "I feel pretty honoured to get the chance to play 500, and hopefully there's another 500 on the way." Returning to the familiar on the ice has come with a renewed sense of family off of it. He can learn to be a leader for his kids like his father was, but he won't pressure Cooper and Beckham to follow the path that he did. "The youngest has a stick in his hands a little more, but I'm just going to let them do their thing," he said. "Whatever they happen to like, I'll support them in that. They're great kids, Rachel and I have really enjoyed it, and it's been a real rewarding experience." Much like he felt as an 18-year-old, Gagner comes back to the Oilers committed to contribute and help the cause in any way possible. "I feel like I'm coming back here a more well-rounded player, and I think I can contribute in a lot more areas than I could when I was younger," he said. "I think you go around and especially for me, when you find ways to stick around the league, you have to adapt and I feel like I have. There's a lot of upside to the group here and I think I can add a lot of value and I just want to continue to play hard, be a leader and a pro every day, and help the team move forward." There was a lot to unpack about his return to Edmonton before that drive up the I-95, and he hopes he won't have to pack again anytime soon.